I have a background in Veterinary Medicine. My Bachelor’s degree is from Bogor Agricultural University in 2013 and my research project was ‘Reproduction Potency and Reproduction System Morphology of The Javan Slow Loris (Nycticebus javanicus)’, a critically endagered primate of Indonesia, carried out in collaboration with International Animal Rescue located in Bogor (slow loris sanctuary). I found that the reproduction potency of Javan slow loris (determined using histology) is remarkably high shown by the number of follicles reaching 142,796. However, offspring realization (number of follicles utilized for fertilization and number of offspring being born) was very low throughout its reproduction life under natural conditions. The unused follicles are potentially advantageous for embryo biotechnology if applied as a wildlife management technique. In 2013, I was selected as the National Outstanding Student of Indonesia. During the selection process I presented a paper on saving endangered primates of Indonesia, entitled ‘Potency of Embryo Biotechnology for Endangered Primates of Indonesia’, using the Javan slow loris, pig tailed langur and Sumatran orang utan as case studies. 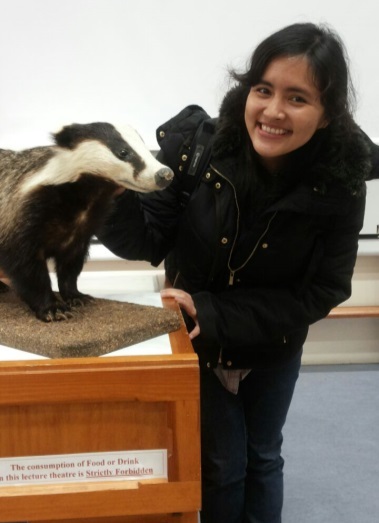 In June 2014, I won a four years Postgraduate Scholarship from the Indonesia Endowment Fund for Education (LPDP), giving me the opportunity to join WildCRU in October 2014 for my DPhil (Doctor of Philosophy/PhD), where I am going to work on ‘Reproductive Endocrinology of the European Badger (Meles meles): Insight to it’s reproductive cycle, lifetime reproductive strategies, cub development, and reproductive olfactory advertisement.